At the end of the 19th century, American quilt design was turned on its head by women making wildly embroidered, richly textured, and shockingly asymmetrical “Crazy Quilts” made from velvet, silk, and plush fabrics. 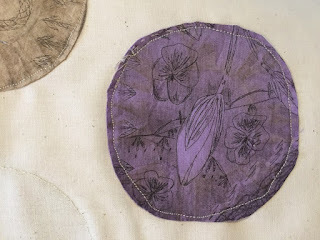 Henrietta Bryan Lambie (1852–1932), a Northampton resident, started a crazy quilt in 1884, at the height of the American crazy quilt craze. Her quilt was made as a memorial to the two young children she lost that year. Keeping Busy includes Lambie’s quilt alongside the artwork of five contemporary artists who have varied approaches to textile art and a shared interest in history and women’s stories. Each artist has created a new piece in response to Lambie’s mourning quilt, investigating themes as diverse as the Victorian language of flowers, personal loss, Reproductive Justice, Victorian and contemporary American mourning practices, popular images of childhood, family textiles, and making do. An exhibition catalog, including an introductory essay and artists' statements, will be available at the opening. Supported in part by the River Valley Food Co-op. Thank you!